State Rep. La Shawn Ford (in the back, second from left) Lt. Gov. 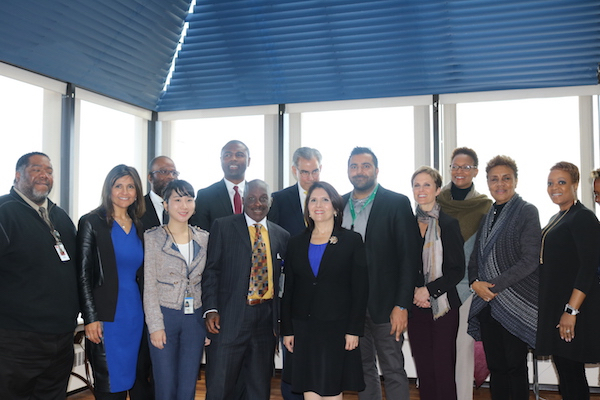 Evelyn Sanguinetti (front center) and state Rep. Camille Lilly (third from right) attended last week's event held at Loretto Hospital, as did George Miller, president and CEO of Loretto (front row, fourth from left). Ford was joined last Wednesday by Lt. Gov Evelyn Sanguinetti and members of Ford’s West Side Heroin Task Force. The event – held on the 50th anniversary of Dr. Martin Luther King Jr.’s assassination – offered members of the task force, a diverse array of legislative and medical professionals, a chance to address the state of the opioid epidemic and outline plans to fight it. Speakers included Loretto Hospital President and CEO George Miller; Beverly “BJ” Walker, director of the Illinois Department of ; Children and Family Services; and James T. Dimas, head of the Illinois Department of Human Services. Also present were residents from A Safe Haven, a residential treatment center for recovering addicts located on the West Side, who hope to see an increase in the number of long-term treatment programs like theirs. Between 2014 and 2017, the number of annual opioid overdoses on the West Side have tripled from 600 to 1,900. Across the rest of Illinois, that number has doubled. “Everyone has been impacted by this epidemic, and everybody needs to pitch in and help,” said Amanda Kim, head of strategic health initiatives at the Illinois Department of Public Health. Ford spearheaded the creation of the West Side Heroin Task Force in 2016 to address this inequality and to determine the best course of action for alleviating the opioid crisis. The task force includes staff from Loretto Hospital and Roosevelt University, drug policy experts, former users, physicians and advocates. Loretto is the only hospital on the West Side to offer comprehensive addiction treatment including inpatient, aftercare and Suboxone treatments. Other speakers highlighted the numerous ways the opioid epidemic has affected the West Side. The event was held on April 4 to underscore the social root of the opioid crisis. Eighty-three percent of Chicago’s opioid hospitalizations occur on the West Side, and the African-American community is disproportionately affected. Gov. Bruce Rauner signed an executive order in fall 2017 creating the Opioid Prevention and Intervention Task Force, which Sanguinetti co-chairs. That action came after the first-term governor received flak for vetoing a 2015 bill known as the Heroin Crisis Bill, which was sponsored by Ford. The Illinois House overrode the veto. A former gang member hopes to help others by sharing his past troubles.